Get ready to terrorize the galaxy. League of Legends fans are in for a treat. 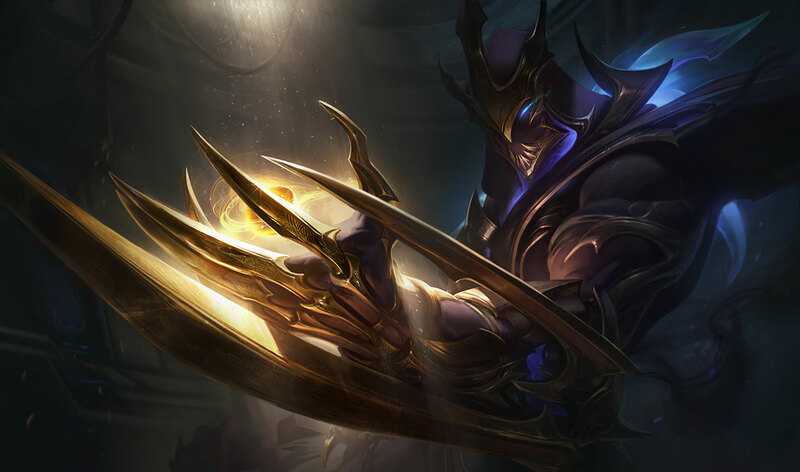 The latest Public Beta Environment update has brought in the newest login screen for its upcoming skin, Galaxy Slayer Zed. The newest villain in the Odyssey skin line lore has a sinister soundtrack to go along with his shiny new intergalactic suit. The login screen has Zed holding a glowing orb in the foreground, while also showing the unsuited assassin in the background. He crushes the orb with his hand and it explodes, giving him his menacing, golden armor and giant blades. The music is intense and booming—perfect for a man who wants to destroy anyone in his way. In other news, there are a few champions getting more balance changes on top of the adjustments they got yesterday. Fiora’s Bladework had its attack speed reverted from 75 percent to 50 percent and Master Yi can now walk through units during his Highlander. Good news for Morgana mains, as all the major nerfs she received were reverted back to their original state today. A few Ornn-only items were buffed as well—Forgefire Cape, Frozen Fist, and Infernal Mask both had their armor and magic resists increased. The changes to his E, Searing Charge, were also reverted back. A few tanks saw some adjustments too, as the changes to Trundle’s Pillar of Ice were reverted, while his ultimate’s cooldown was lowered from 110/90/70 seconds to 100/80/60 seconds. Lastly, Renekton saw some buffs to his base HP, attack speed growth, and armor growth. His Q ability, Cull the Meek, has had its healing multiplier increased from 3x to 4x. Try out all the new changes in the PBE and see how they’ve affected your favorite champions.